I always admire a product that has a multi-purpose. You can benefit from the money you spent towards the item because it serves 2 different ways. 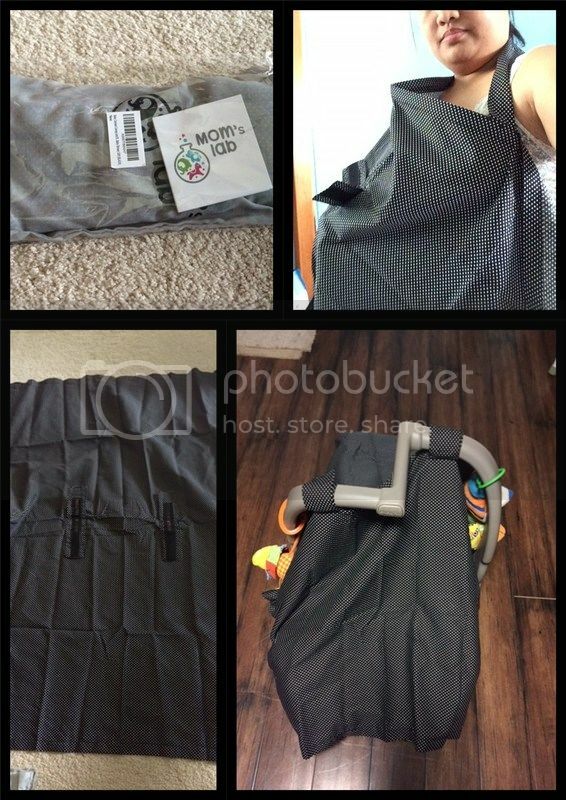 I was very ecstatic to have an opportunity to work for a 2-in-1 Nursing Cover and Car seat Canopy from Momslab. I'm not sure if you are all aware that I exclusively breastfed my son since birth. YES!!! I want to share the benefits of breastfeeding with my son is something I aim since the time I knew I was pregnant by him. This product is not only for a carseat canopy, but also designed for a nursing cover. YES!!!! Now, I can nurse my son without feeling awkward in the public area. The cover is truly not see-through because of it's very stylish color and unique design. The product arrived in the mail via UPS. I don't see any signs of damage or rip the that I was able to use and evaluate it right away. Very lightweight, I like the idea of the pouch, which is very neat. I can definitely store or take it within my diaper bag whenever I don't use it. It's not bulky of course, as the slim and soft kind of fabric they use in the product that would touch my son's soft skin is just I'd like to have. The velcro that would hold the handle of the car seat has a strong grip that won't come off when you attached it. There were also at least 4 other velcro that can be found on the upper and bottom edge of the canopy to make sure it will fully cover the car seat whenever it is used. I like the product very much. I'm glad that I was able to use this during the right time. I appreciate covers like these, people are getting more and more creative with breastfeeding covers these days. I like this one because it's not something that can cause stress for you and the baby as well as it's easy to pack. It's a nice product for moms with breastfed babies. Like you, I like versatile products, too. Wow! mura na, very stylish pa. do it comes in other colors? I wish I learned about this product when I was still breastfeeding my son. He is 8 years old now. I wish I have one like that when I was still nursing my kids. Sounds like a nice "accessory" for breastfeeding moms. Very functional, with dual purpose, perfect for moms on the go! I really like this nursing cover. It keeps the baby well feed and the nursing Moms comfortable without the public eye's giving them a hard look.